Tropical plants are favorites because of the very colorful flowers that they produce, according to the University of Illinois. 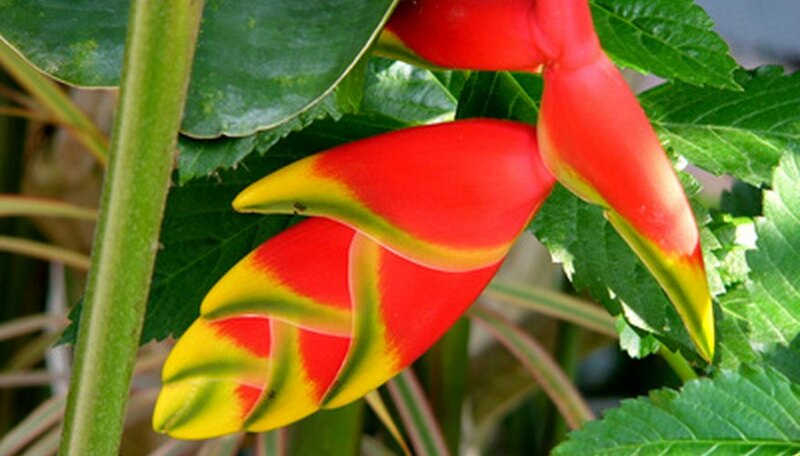 Many tropical species are also good household plants. The characteristics with which tropical plants can be identified has a lot to do with whether they came from the rain-soaked rainforest or the dry savannah. Tropical plants often grow well as indoor plants, though the humidity of the home sometimes needs to be increased for the tropical plants, according to the University of Illinois. You can often transport these indoor tropical plants to the backyard during the summer. Tropical plants need warm weather to survive and are usually not able to survive in the winter, according to the University of Illinois. Plants that have to be moved indoors or into greenhouses in the winter are likely tropical plants. Plants from tropical rainforests had to adapt in order to survive large amounts of rain. These plants often develop drip tips, which are structures designed to let water wash away epiphytes and fungi that tend to grow in moist conditions such as a soaked surface of a plant’s leaf, according to Marietta College. Tropical plants tend to grow quickly if they receive a lot of sunlight, water, humidity and nutrients in the soil, even more so than other plants, according to the University of Illinois. However, some tropical plants have adapted to survive in conditions where there is deficient sunlight, such as plants that grow on surface levels in the rainforest. This is because many rainforest trees develop canopies that block out much of the sunlight, according to Radford University. Many trees are able to remain stunted when there is not enough sunlight until there is an opening in the canopy. Then these plants experience a surge of growth. Some tropical plants do not need soil, since they must climb up the trunks of the larger trees in order to reach sunlight. These plants are often able to collect water from the air and get their nutrients from falling leaves and dust. Some plants are rooted but send vines up the trunks of trees in order to reach sunlight, according to Radford University. There are also plants that are able to steal nutrients from other plants, yet still produce flowers. Some tropical plants come from tropical savannas. Most of these plants have the ability to store a lot of energy and water in their roots for when water becomes scarce. Plants that only develop leaves when they receive water are likely from a tropical savannah, according to Exploring the Environment.